We’re going to go forward in time from our last episode nearly a millennium. Last time we talked about the Gnostics and the serious challenge they presented the Early Church. The dualism that lay at the heart of Gnosticism continued to rear its hoary head in the centuries that followed. It was part & parcel of the Zoroastrianism & Manichaeanism rooted in Persia and was the official faith of the Sassanid Empire. Dualistic ideas were so popular, they managed to infiltrate many Christians communities in both the eastern and western halves of the Roman Empire. When Rome fell and Byzantium carried on in its place, the influence of dualism lingered. Church leaders were able to hold it at bay by using the work of earlier fathers who fought Gnosticism. But as those works fell out of use, dualism resurged. This dualism came in many forms, as we’ll see. But the basic idea was that the forces of Light, Good, and God are on one side with the powers of darkness, evil and the devil on the other. And if your response to that is, “Wait! Isn’t that what the Bible says?” There’s another important component we need to insert: In dualism, the two sides are equal in relevance and power. They are co-eternal, and going way back to the beginning, they were originally joined into a whole that somehow got split and led to the creation of the physical universe. If all this sounds vaguely like the plot for an upcoming Superhero movie, it’s all just a coincidence. à Or is it? The expression most forms of dualism take is to make the immaterial spiritual realm the side of light, good, and God while the physical realm of space & matter are the domain of darkness & corruption. So, as with the Gnostics, salvation in dualism get’s hijacked from being redemption from the Fall to an awareness of your innate inner goodness. Dualism appears to have experienced a resurgence in both the East & West at about the same time in the 12th C, though the two streams probably weren’t connected. They became so popular, a couple Crusades and the Inquisition were used to stop them. The first we’ll deal with was called Bogomilism and arose in the region of Bulgaria. Bogomil is Slavonic for “beloved of God.” That was the name of the man who began the movement associated with him. He was a priest who lived at the in Bulgaria during the mid-10th C. Bogomil was influenced by a group known as the Paulicians, sometimes called the Paulicans. These were a moderately heretical group that was reconciled to the Roman Church in the 17th C and exists to this day as an affiliated group with Catholicism, though with their own rites. There’s debate about the origin of the title “Paulician.” They said they took their name from the Apostle Paul, claiming that their ideas were derived from the famous Apostle. Others say they drew their name from Paul of Samosata, a 3rd C heretical bishop of Antioch. Since so many of the Paulician beliefs ride tandem with the errors of Paul of Samosata, it’s safe to conclude that’s where they got their title. They flourished from the mid-7th to mid-9th Cs in Armenia. Armenia has the distinction of being the first officially Christian nation. About AD 300, King Tiradates III became a believer and turned his court into a Christian concern. During the 4th C, the Armenian church was under the influence of the ultra-orthodox Cappadocian Fathers. But after the Council of Chalcedon in 451, the Armenia sided with the Egyptian monophysites. Not long after the orthodox Faith was brought to Armenia, disciples of Paul of Samosata arrived and began spreading his adoptionistic ideas. Adoptionism was the belief that Jesus wasn’t the eternal Son of God. Adoptionists said God adopted a man named Jesus at His baptism to BE the Messiah. He was a kind of first round draft-pick. Armenia’s location next to Persia saw some of the dualistic ideas of Manichaeanism also infiltrate the church there. But 300 yrs would go by before the Paulicians would emerge as an identifiable group. When they did, the Byzantine Emperors alternately ignored and persecuted them. When Theodora became Empress, she had the Paulicians forcibly relocated to Thrace in the mid-9th C, hoping they’d act as a bulwark against the hostile Bulgars. That’s where they came into contact with the group that would later be called Bogomils. The Bulgars were a Turkish people recently Christianized by missionaries. Their ruler, Boris, asked the Franks to send missionaries to help his people with their new Faith. He didn’t appeal to the much closer Constantinople because he was already wary of their influence and authority. But that was not about to stop the Byzantines from asserting their control over a region they deemed within the sphere of their hegemony. Constantinople not only sent missionaries to Bulgaria, they sent an army. Boris had to capitulate and was baptized in the Eastern Orthodox Faith, taking the new name and title Czar Peter. Byzantium then had a slew of weak & mostly worthless emperors. They suffered a major defeat at the hands of Muslim forces at the Battle of Manzikert in 1071. A decade later, relief arrived in the form of a new & vital leader, Alexius I Comnenus. Comnenus was more than a talented and decisive ruler. He was also an astute lay theologian. He formed the Paulicians in his hinterlands into an allied force & led them into a campaign against the Normans who’d been seizing territory in the West. But as they entered battle, the Paulicians proved false and deserted. Comnenus’ remaining army managed to pull off a victory. When the triumphant Emperor returned to Constantinople he imprisoned the Paulicians leaders. The remaining Paulician population, bereft of leadership, became an easy target for round two of Comnenus’ strategy in dealing with them. He sent in orthodox missionaries and priests who evangelized them into Orthodoxy. The imprisoned Paulician leaders were also evangelized by orthodox apologists, with many of them converting. Even the Emperor engaged in this proselytizing work. Their two chief leaders, Cusinus & Phulus, remained firm in their devotion to their heretical tenets and so were kept in prison in comfortable accommodations until they died. It was this phase of Paulician history that saw the movement shed its more aberrant ideas in favor of an orthodoxy that allowed it later to become affiliated with Roman Catholicism. That it chose to merge with that branch of the Faith rather than the nearer Greek Orthodoxy of Byzantium stands as a reminder of the tension and animosity between the Paulicians and the Eastern Church. And that leads us to another heretical movement: The Bogomils. In the last 2 yrs of his reign, Emperor Alexius Comnenus was made aware of another religious movement that had sprung up in the Western reaches of his realm but had grabbed disciples right in Constantinople. By the time he was made aware of it, it had already established an underground church with its own bishop. Alexius pretended to be interested & invited that Bishop, named Basil, to the palace to share what this new movement called Bogomilism believed. Scribes hidden behind drapes recorded every word. As Basil listed off Bogomilian doctrine, he supposed he was speaking to a theologically un-informed civil ruler. He didn’t realize he was ticking off heretical ideas to an astute theologian who was mentally dismantling each and every idea. So when Basil was done, it was Alexius’ turn. He proceeded to list Basil’s erroneous doctrines, then he called on the bishop to renounce them. Basil refused and was imprisoned. Alexius then visited Basil in his cell several times in the following week, reasoning with & urging him to be converted to an orthodox faith. Basil refused, and was condemned to be burnt at the stake for heresy. While such executions would became common in the West, they were a rare occurrence in the Eastern Empire. Sorting out the beliefs of Bogomilism is a challenge because it was a faith in flux that evolved over time. But from Alexius’s diligent secretaries, here’s what their Bishop Basil said they believed . . . And get ready, because it’s a wild ride . . .
Bogomils said A singular supreme God who was utterly spiritual, had 2 sons: the elder was Satanael, while the younger was Jesus. The elder son rebelled and was banished from heaven. In exile, he created the material world and humanity. But he was unable to give the first man, Adam, life & asked God for help. Actually, he tricked God into it, saying the man would be a diligent servant to God. So God complied and man became a living being. But the man was a divided identity. Having a spirit, his potential was to be a servant to God, but possessing a body, he in fact became a servant and ally of Satanael. After fashioning Adam, Bogomils said Satanael created Eve, had sexual relations with her, the product of said union being Cain. Then, tempted by Eve, Adam begat Abel. Later in history, the human race produced a person who plead with God to save them. God answered by sending His Son, the Logos, who entered a Virgin’s ear, took flesh from her, and emerged with a body from the same era. Although, how He did that is difficult to fathom. The Son, known as “Jesus” grew to maturity, only appeared to die, descended into hell, where he defeated and bound Satanael, revoking his suffice –el and turning him into the more familiar Satan. And this is where it gets really confusing, in case you aren’t already. Even though The Son took flesh from somewhere inside Mary’s head, He didn’t really have a body; He only appeared to, which for those of you who are keeping track, is the ancient heresy known as à Docetism. Hey, seriously, if you said that to yourself before I said it, give yourself a pat on the back and go buy yourself your favorite hot or cold drink. Here we see the inevitable internal contradiction that comes with dualism. How can Satanael, who ever & always remained a spirit BE evil, when Jesus the Son, Who took on a body, BE the Holy One Who affects salvation? “Well,” the Bogomilian replies, “Jesus didn’t really have a body; He only SEEMED to.” Okay, even if we give them that, we’re still faced with the fact that the Holy One, the Good Son, then play-acted at having something that was corrupt and evil, while the Evil One & Bad Son remained a pure spirit. Listen: If my 15 yr old son tells me he wants to be a missionary, and gives every indication that he has a solid and mature walk with God, but one day I find him sitting on the couch in the living room reading a pornographic magazine, we’re going to have a chat. But let’s say once I sit down and start in on him, he smiles and turns the magazine toward me to reveal that it is in fact nothing but the cover, I’m going to be immensely relieved. But the question remains: WHY would he even have the cover? What’s going on in him that would move him to the appearance of evil – which of course God’s Word waves His people off from. The dualism of Docetism, and it’s later manifestation in Bogomilism, fails epically right there. How could Jesus as the Son and Word of God even APPEAR to have a body, if a body was unalterably corrupt & evil? Well, Jesus prevailed over Satan, whose realm of authority and power was then confined to Earth. Which of course according to the usual dualistic machinations was a realm of evil because it’s made of matter. But on that evil Earth dwell those dualistic creatures called man who are both body & spirit. So God sent the Holy Spirit to indwell his faithful ones, AKA Bogomils. The Bogomillian End of the Age has the Holy Spirit ascending back to Heaven & together with Jesus the Word, both are reabsorbed into the Father, or one true God. Bogomilism rejects such orthodox doctrines such as the Trinity. It regards the Cross as repugnant and has nothing to do with either baptism or communion, since such things require contact with physical matter. But Bogomilians often lived highly-disciplined lives of an apparently laudable morality that proved attractive to Orthodox believers who weren’t so impressed with the casual indifference some Orthodox leaders displayed. The same happens today. Some of the cults show a fastidious diligence in pursuing the rigors of their faith, in the mistaken hope of earning points with God and maybe getting into heaven. That religiosity can appear attractive to nominal believers who are used to seeing professing Christians failing to follow through on a consistent lifestyle of devotion to Christ. So converts were made from the ranks of orthodoxy into the Bogomilian camp, not out of doctrinal persuasion by but by the practical theology of daily life. Like the Gnostics before them, Bogomilians divided their followers into ordinary, everyday believers and the choice elect. These elect had to face special trials and challenges. If they proved their worthiness, they were given a secret and complex initiation that ushered them into the exalted ranks of the Bogomilian Elite. They were regarded as being equal to such lofty figures as the Virgin Mary and each were even called Theotokos = Mother of God. They only prayed one rote prayer; The Our Fa­ther, which they repeated several times a day. 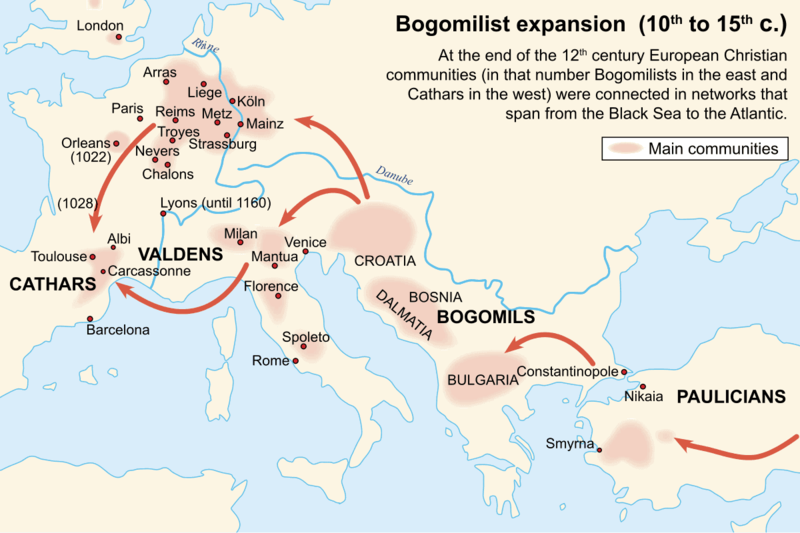 After the conquest by Western armies of Constanti­nople in 1204, the Byzantine government’s check on the spread of Bogomilism was nearly shattered. The movement grew until the Balkans where they were centered was conquered by the Turks in the 15th C.
Like the Monophysites some 8 Cs before them, the Bogomils were receptive to conversion to Islam when it took hold of their homeland. As we wrap up this episode, let’s consider how and why Bogomilism presented a challenge to orthodoxy. 1) Probably most telling for the average Christians was the fact that Bogomilians practiced their faith more zealously than the many of the Orthodox. 2) While Christianity seemed to struggle and to some, even stumble when it came to answering the age-old dilemma of evil, Bogomilism seemed to provide an answer. 3) Because too few Christians were equipped to dispatch the ideas of the Bogomils, authorities resorted to force, turning what had been a Church of the Martyrs into the Martyr-makers. Those 3 points will shape our next episode, because they prove to be compelling issues in our examination of Heresy & Heretics.